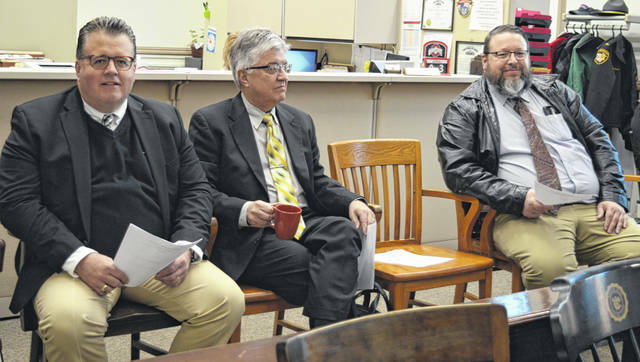 Gathering Wednesday for an elected officials meeting and sitting together are Clinton County’s three full-time judges: from left are Clinton County Juvenile/Probate Judge Chad L. Carey, Clinton County Common Pleas Judge John W. “Tim” Rudduck, and Clinton County Municipal Court Judge Michael “Mike” Daugherty. WILMINGTON — County commissioners are looking to add content to the county’s website and perhaps make it a place to pay taxes, fines and fees. The website topic came up during an elected officials meeting Wednesday with commissioners held in part to discuss ongoing preparations for the county courthouse’s centennial celebration scheduled for Saturday, Oct. 19. Clinton County Commissioner Mike McCarty said the county website is not bad, but it does have an older platform technology. McCarty suggested the website be more involved in e-commerce, and in that regard asked whether there could be a way to collect fees through the website. He also encouraged the various county government offices to have an FAQ feature on their individual pages so that answers would be provided online to Frequently Asked Questions. The commissioner said he’s sure the county offices get the same questions asked every day — questions which then the office staff have to answer. Having those answers online would make for a more efficient work flow in the offices. And then there’s the desire to encourage economic development within county lines. Clinton County Treasurer Jason F. Walt recommended sending out a questionnaire to department heads to find out what the different offices would like on their particular web page. He urged getting as much content as possible on the county website as a citizen/customer service. “The website is the first thing people look at for Clinton County. Let’s make it top-notch,” said the county treasurer. • In the next three or four months, Clinton County Sheriff Ralph Fizer Jr. wants to move forward on a $75,000 state grant, already awarded, to build a small Clinton County first-responders tribute. He would like to form a committee of law enforcement and firefighters who can view other first-responders memorials to come up with a local rendition. • Mention was made Wednesday that during the commissioners Monday night joint meeting with Chester Township trustees that there was a concern expressed about the coverage area in Chester Township of the MARCS (Multi-Agency Radio Communication System) public safety radios. Commissioners expect to revisit the matter next Monday. • In conjunction with June being Lesbian, Gay, Bisexual and Transgender (LGBT) Pride Month, a local group the Alliance for Compassion & Truth (ACT) will hold a Pride Celebration from noon to 2 p.m. Sunday, June 9 on the Main Street side of the courthouse steps and sidewalk. Commissioners on Wednesday approved a permit to use public property in connection with the event. • Plans call for articles plus staff photos of the 13 government departments at the courthouse to be published in the News Journal leading up to the courthouse centennial in October. The weekly series is scheduled to start in mid-July.